St Martin was born into a noble family near Todi, Umbria, Italy. He is said to have been, “A great student, of commanding intelligence, profound learning and great charity to the poor”. 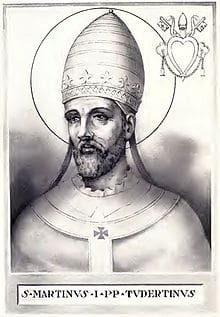 St Martin was appointed Pope in 649 but his papacy was relatively short lived. Soon after his appointment, he was exiled by the reigning Emperor Constans II to Crimea, enduring a long and tortuous journey through Greece and Turkey in 653. The reason for his exile was his insistence in publishing the orders of the Lateran Council of 649 which viewed the Monothelites teaching as heretical. St Martin’s Feast Day is 13th April. Pray for us that we will remain steadfast in upholding the teachings of the Church.